BBC World Service - In the Balance, Is the Green New Deal too ambitious? Can a plan to pump trillions of dollars into the US economy to tackle both poverty and climate change really work? 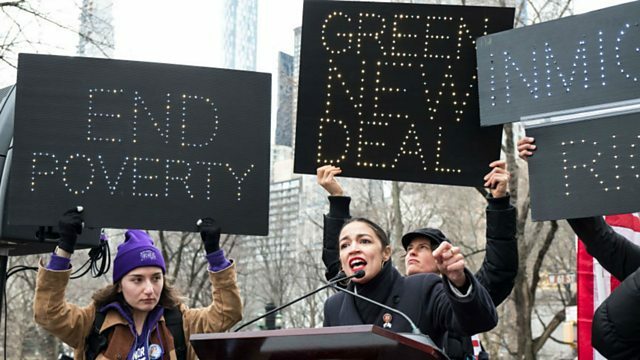 As the warnings around the risks of climate change increase, some in the left, led by US democrat Alexandria Ocasio-Cortez, are trumpeting an economic solution called the Green New Deal. The idea is that a massive public injection of money could fix the shortfall in green tech in the US, turn America into a zero-emissions economy and tackle poverty all at the same time. But how would such a plan work? Do the numbers add up or is it just fantasy economics? Joining Ed Butler to discuss this are Ellen Brown, author and activist and the founder and chair of the Public Banking Institute, a nonpartisan think tank devoted to the creation of publicly run bank; Alex Douglas, a lecturer in philosophy at the University of St Andrews and the author of the book, The Philosophy of Debt; and George Selgin, director of the Center for Monetary and Financial Alternatives at The Cato Institute in Washington DC.